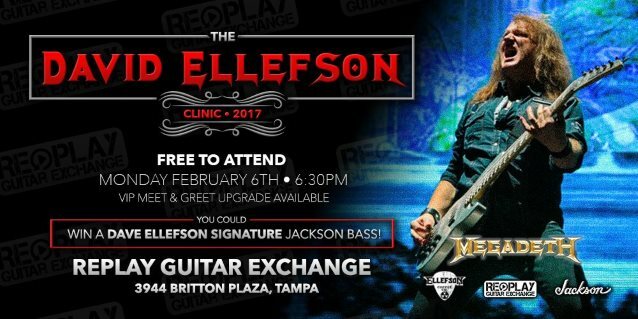 MEGADETH bassist David Ellefson held a special clinic on February 6 at Replay Guitar Exchange in Tampa, Florida. Video footage of his appearance can be seen below. Asked by Myglobalmind in a recent interview how important it is to stretch out beyond MEGADETH with coffee, producing bands and having his record label (Ellefson Music Productions) for retirement should MEGADETH come to an end one day, Ellefson said: "It's very important. In the early days of MEGADETH, we had success in spite of ourselves. [Laughs] We were young, wild, and rocking hard, but there came a point in the '90s when we realized we had to change our lifestyle and how we operated. That provided us with a new mindset around our organization. That has helped us thrive and survive until the current day. "I think MEGADETH has always have had a strong business acumen on top of the creative side," he continued. "The Ellefson family, through the generations, has always been business-minded, educated men. I've gone to college, worked in business, and think it requires a level of being able to step back to be an observer as well as a servant at the same time. "Business is really about serving your customers where rock 'n' roll is about icon worship. [Laughs] I think there is this left-brain-right-brain mentality that I have always enjoyed in my life. To have that balance so when I step away from the stage to do other things, it allows me to enjoy the stage that much more; rather than the stage being the only thing I have in my life." Ellefson is the author of several books, including "My Life With Deth" and "Making Music Your Business...A Guide For Young Musicians". Academically, Ellefson holds a bachelor's degree in business marketing and continues to lecture on a variety of music- and business-related topics. 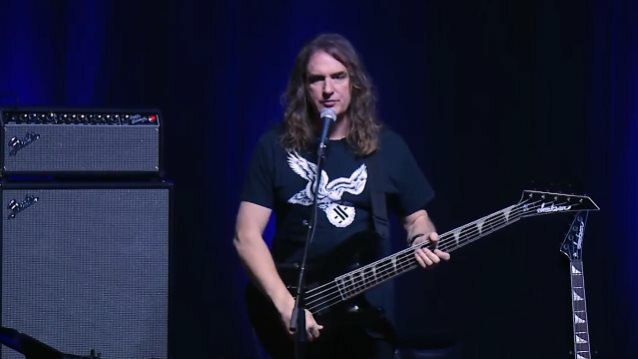 In addition to Ellefson, MEGADETH's current lineup includes guitarist/vocalist Dave Mustaine, Brazilian guitarist Kiko Loureiro, best known for his work with ANGRA, and former SOILWORK drummer Dirk Verbeuren.